HTC Desire Review - Learn everything you need to know about the HTC Desire before you buy. If you are a current HTC Legend owner, this phone is almost identical in form. The Desire has been updated with a larger 3.7 inch screen, faster processor, Android 2.2, 128 megabytes more of physical memory and physical buttons on the front. It uses the same familiar Sense user interface which carries Friend Stream-HTC’s social network aggregation app. The Sense UI comes with a Flash Lite Plugin which allows to you play flash videos directly from a website. It’s a little bit shoddy right now, but after some tweaking might be pretty handy. Overall, the Desire has good call quality, a great social network experience, decent web browsing, and good picture and video quality as well. 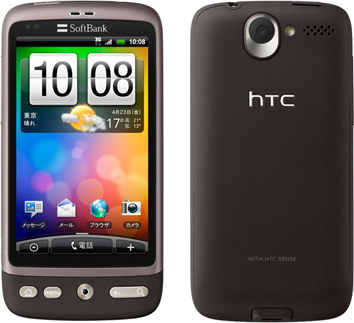 The design is extremely similar to the Google Nexus One and HTC Legend. They made a few minor changes which seem to be good improvements. They added physical buttons on the face of the phone which are nice touch (pun intended). The 3.7 inch, 800 x 480 resolution screen seems nice, but is pretty worthless in bright daylight. It’s just as thick/thin as any other smartphone and has a great feel when holding the phone. The 5 MP camera takes good pictures, but lacks quality while filming anything at night. It does have an LED flash, but you are unable to record in HD. Friend Stream is one of the HTC’s UI best features. It combines all of your social networking into one big stream so you aren’t switching back and forth between apps. For music lovers, the player works and looks great and is easy to use. The battery life is above average as far as official talk time goes. HTC rates it at 390 minutes of talk time and 340 hours of standby time which are both right at the average for smartphones. You will probably need to charge this phone every night to get a good days use out of it. The Desire has all the typical features for a smartphone including wi-fi, GPS and Bluetooth. With the GPS feature you can download maps quickly which is nice for the business traveler.